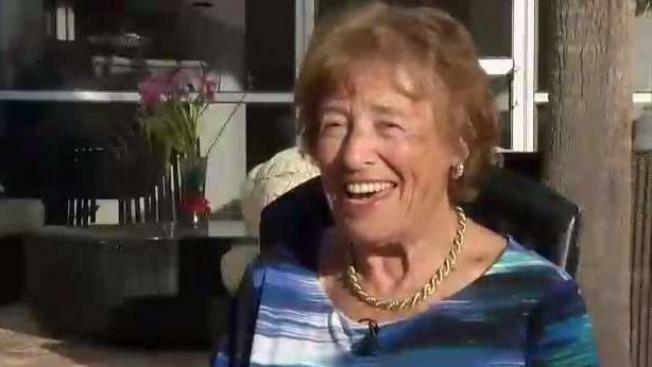 A woman who survived the holocaust jumped out of a plane to fulfill the skydiving birthday wish of her 18-year-old grandson. NBC 6's Amanda Plasencia reports. Henriette Siebenberg, an 85-year-old Holocaust survivor, is a thrill-seeking grandmother who proves that age is just a number and fear –even of heights– is an illusion. To celebrate her grandson Schmuel Eisenmann's 18th birthday, Siebenberg joined him for a daring jump out of an airplane. Siebenberg's father was killed in the Auschwitz concentration camp. She was raised by a Catholic family in France. The primary focus of Siebenberg's life is her family. She hopes to take the sky-diving plunge with her other grandchildren. The thrill-seeking grandmother shared her secret to staying forever young. “Try to enjoy life, because you never know if you wake up tomorrow. You never know. Every day is another day," she said.